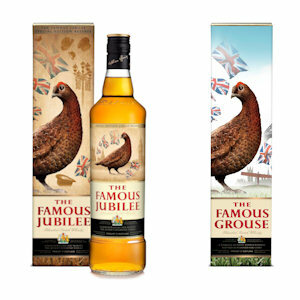 Maxxium UK is celebrating a summer of great importance to the nation with a new liquid and two new limited edition gift packs for The Famous Grouse available through exclusive partnerships with Waitrose and J Sainsbury. The Famous Jubilee, Special Edition Reserve has been created for an exclusive partnering with Waitrose in a bid to help develop value into its Scotch category through innovation and will be available in-store from May with a RRP of £24.99*. The Famous Grouse Master Blender Gordon Motion has crafted a special blend of aged whiskies from specially selected casks of the finest malt; such as The Macallan and Highland Park, and blended them with sweet grain whiskies for a smooth finish.This outstanding blend has been aged in oak casks to develop a unique richness and depth of flavour characterised by the unsurpassed smoothness that is the brand’s hallmark. The bottle will carry a commemorative label and be displayed in a gift carton inspired by Her Majesty The Queen’s 60 year reign. In a separate exclusive partnership with J Sainsbury Maxxium has created a limited edition carton for The Famous Grouse which has been designed to celebrate the summer. The unprecedented number of summer events and the opportunity to celebrate them has been the inspiration behind the pack which will also feature landmarks from around the UK in celebration of all things British. The limited edition pack will be available in J Sainsbury stores for a RRP of £15.99** from May and carries the cocktail recipe for the brand’s Ginger Grouse serve, a mix that is now available in RTS cans and on draught in bars across Scotland. David Everett, Off Trade Sales Director for Maxxium UK, commented: “ As proud holder of a Royal Warrant of Appointment to Her Majesty The Queen, The Famous Grouse is delighted to celebrate her 60 years on the throne with the creation of this special blend of aged whiskies. In a summer that encompasses so many more reasons for celebration beyond the Jubilee it also seemed fitting to create a limited edition gift carton in honour our great nation.